Think of health. Think of wellness. Think of nutrition. What kind of images come to mind? Exercise? Fruits? Vegetables? Lean meat? Supplements? How about dirt? That's right, dirt. Soil is the primary factor in nutrition because all of our food comes from the earth. Our bodies are composed literally of Mother Earth. Minerals in our bodies are directly connected to the state of our soil. If an element is missing from our soil, it will be missing from the foods we eat; hence, we will not be properly nourished. Unfortunately, that is the reality of today's soil. It's a fact. 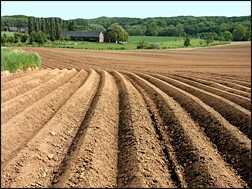 Our soils are depleted and depleted soils do not produce healthy, nutrient-rich plants. It's also a fact that crops produced in depleted soils are more prone to the invasion of insects, viruses, fungi, etc. Insects and infectious organisms were designed to get rid of unhealthy vegetation and they do not typically attack truly healthy plants. Much of the modern world is now aware that our industrialized methods of farming have depleted the soils and created a cycle that requires pesticides to protect the unhealthy crops grown on depleted soils. The commercial applications of agriculture have not only depleted the soil of precious trace minerals but also have broken down the ability of plants to utilize those elements. That means our food is nutritionally deficient right from the source. Then our food is refined and processed, which further degrades the nutritional value. And who suffers? We all do! There are more than 70 trace minerals necessary to produce healthy, nutrient-rich crops, yet most current farming methods routinely put back only three to five of them. And that's only part of the problem. Inorganic (synthetic/dead), ammonium-based fertilizers, along with herbicides and pesticides, kill the precious microorganisms in the soil that are essential to the creation of organic (carbon-based/living) mineral complexes. We have done more than simply use up the available trace minerals in our soils (those in the form of organic complexes); we also have destroyed the means of replenishing these soil-based microorganisms. Is there a consensus among health care professionals that depleted soil is a nutritional concern? While there are still some diehards who believe you can avoid the need for supplements if you eat a "balanced diet," it is a verified fact that our livestock feeds contain nutritional supplements. Without supplemental nutrients being added to the feed, far too many animals were getting ill. What does that tell you? The grain does not possess enough nutrients to keep the livestock healthy. If our livestock can't stay healthy by eating our modern crops, how can we? Prior to the 1800s, farmers fertilized their crops with organic substances. But modern, economic-based agriculture has virtually replaced all of the critical organic complexes with inorganic fertilizers, which cause toxicity in water runoff and further imbalance the delicate nature of our soils. In the 1930s, when farmers began to add inorganic fertilizers to the soil, it was presumed that biological organisms could assimilate minerals in any form. Unfortunately, this is not the case. We are now discovering that inorganic (synthetic/dead) minerals and trace minerals cannot be easily assimilated by plants. They must first be combined with carbonaceous matter (organically complexed), before they can be used. No wonder our food is less and less nutritious. No wonder it lacks taste, and no wonder the modern farmer has to apply more and more toxic pesticides, herbicides and chemicals every year in order to get the crops to market. Let's look at a similar dilemma: The human body is meant to derive minerals from organic complexes. However, in our case, these complexes were meant to be supplied in the foods we eat. Unfortunately, these critical, disease-preventing, organic nutrients are not present when our food is grown in depleted soils. And, just like the farmer who has attempted to alter the soil with inorganic toxic chemicals and fertilizers, we have tried to add inorganic trace minerals to our diet in the form of colloidal supplements  with even worse potential consequences. It is important to reiterate that most trace minerals are not recognized, absorbed or utilized by living tissue unless they are carried in organic complexes. Even the best inorganic trace minerals (e.g. coral, colloidal and/or ionic) are extremely large and insoluble, with high atomic weights and large sizes, ranging between 1 and 100 nm. These giant (when compared to organically complexed minerals and cell sizes) molecules may be rejected at the cellular level due to their synthetic composition, size or weight. They eventually accumulate in the body and are stored outside the cells in interstitial fluids and fatty tissues. Over time, severe toxicity and disease may manifest. What about inorganic minerals? Aren't they just as healthy? Organically complexed trace minerals are definitively different from inorganic minerals. They are naturally chelated  ultra tiny  and they have ultra-low molecular weight. They are approximately 50 to 100 times smaller and much lighter in weight. They are physically small enough that they can be easily carried into the cells of our bodies. They are bound by carbon (living matter) and have numerous health benefits, aiding in intracellular detoxification and the removal of inorganic toxins from the extra cellular spaces in our bodies (interstitial fluids, and fatty tissue). Thus, when trace minerals are combined with carbonaceous matter, they become an enriching meal of living minerals rather than a toxic plate of inert, dead rocks. The function of organic trace minerals is to be systemic catalysts. They are activators: intracellular "spark plugs." They either "kick off" or "speed up" most of the chemistry that goes on in our bodies. Without trace minerals there is no life! They are responsible for carrying nutrition to our cells. Most scientists would agree we need three basic ingredients to sustain life: water, oxygen and organically complexed (carbon-based/living) trace minerals. Not even vitamins or enzymes can perform without trace minerals, and when trace minerals are lacking, numerous processes either slow down or come to a halt until the mineral banks can be replenished. Knowing this, it is easy to see why both plants and humans are becoming increasingly susceptible to disease. It is also easy to understand what Linus Pauling (twice awarded the Nobel Prize in medicine) meant when he explained to the 74th Congress of the United Sates, "Every ailment, every sickness and every disease can be traced back to an organic trace mineral deficiency." It has become alarmingly evident that we are severely deficient in one of the most basic components necessary to sustain health  organically complexed trace minerals. The use of toxic chemicals eventually sterilizes the soil, reducing the microorganisms that keep the soil balanced. In a way, the problem with depleted soil is similar to the problems of using antibiotics. Antibiotics kill the harmful bacteria making us sick, but they also kill the friendly flora in the intestinal tract at the same time. Antibiotics appear to cure the infection, but in reality, the long term use will weaken the immune system making us more likely to suffer from future illnesses. Similarly, as the "good" microorganisms in the soil are wiped out, the vegetation loses its ability to gain the proper balance of minerals from the soil. The end result: Our bodies take on these deficient foods and become impaired and imbalanced. If our soils and crops are lacking essential minerals, it's necessary to supplement our diets if we are to achieve true wellness. But will any old multivitamin off the shelves of our grocery or drug store do the trick? All biological organisms (including humans) need organically complexed trace minerals in order to maintain health and prevent disease. If, decades ago, we had only protected and nourished our soils from hazardous and toxic chemicals, these critical organic complexes would naturally be in the foods we eat today. Unfortunately, they are not. And now the questions become, how do we get these complexes back into the soils, and what can we do in the meantime to replenish the organic trace minerals in our bodies? The answer to both questions lies in a substance called fulvic acid. Fulvic acid (the end result of repetitive plant decomposition) is the first biological step in changing inorganic trace minerals into organically complexed, soluble trace minerals that can be used by both plants and animals. It is produced in trace amounts by homeostatic soil microorganisms as organic plant matter decays. The process takes hundreds of years and, as with photosynthesis, it cannot be duplicated in the laboratory. Fulvic acid has an extremely small (ultra-chelated), low-molecular-weight molecule that can beneficially modify so many essential biochemical, electrochemical and metabolic processes, and yet, the greater scientific community is still largely unaware of its role. Further research may show that fulvic acid can be used to resuscitate our soils, thus our food sources and finally, our bodies. Until this can be accomplished, high-quality supplements remain our best defense against food devoid of nutrition. Dr. Richard Drucker has performed concentrated research and work in the natural health and nutraceutical fields for more than 15 years. He is CEO and chief technologist of Drucker Labs, a Plano, Texas-based company that manufactures and distributes nutritional supplements.